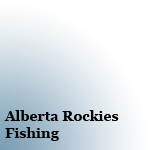 These fishing holes reviewed are found in the Alberta Rocky Mountains and Foothills. Generally these reviews cover places that require some hiking and/or biking but there will be some exceptions. Visit the link here for the latest fish stocking information.